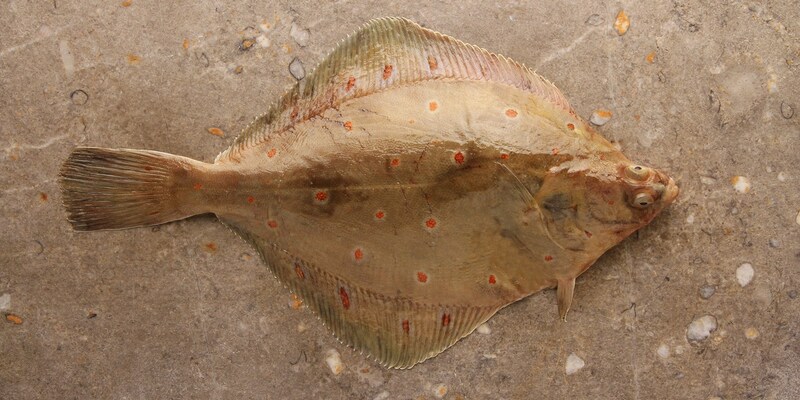 Plaice is a flatfish native to UK waters and is recognisable by its bright orange spots on the dark side of the skin. The fish has been eaten in Britain for hundreds of years and was considered a poor man’s food in Victorian times as it was so plentiful and cheap. Unfortunately, by the beginning of the twentieth century plaice was massively overfished and stocks have still not completely recovered, so in order to allow fish to mature and stocks to replenish it is best to avoid eating fish less than thirty centimetres in length. Plaice is still a cheaper alternative to other flat fish such as Dover sole but is generally much smaller – allow two fillets per portion for a main course and bear in mind the top fillet on which the skin is brown will always be larger than the underside white fillet (which has a white skin). Plaice is generally available all year round but is best avoided during the months of February to April when the fish is spawning, as the fillets will tend to be a little watery and soft. The fish is low in calories and high in protein which makes it a healthy choice as long as the cooking method doesn't require excessive amounts of oil (deep-frying, for example). When buying whole plaice, look for bright orange spots and clear eyes, as these are indications of freshness. Plaice is best eaten on the day of purchase but can be kept until the next day, otherwise it will keep in the freezer for a couple of months. Plaice is very often breadcrumbed and either shallow or deep-fried. Its thin fillets and delicate flesh means quick cooking methods such as frying are perfect. Try cutting into strips before breadcrumbing to make goujons as a tasty snack, or for a healthier option try baking or grilling the fish. Simply season with a little salt and brush with olive oil before placing under a hot grill for few minutes or in a hot oven on a lined baking tray. You could also try cooking a whole plaice for an impressive dinner for two – smother with butter and lemon juice and simply roast in the oven until a knife goes easily through the flesh to the bone. Place has a mild, sweet flavour that can be easily overpowered so it is best to keep garnishes simple. A fresh green salad would be a light, healthy accompaniment to Galton Blackiston’s easy Plaice with tartare sauce, or try Andrew Mackenzie’s gently steamed plaice lightly flavoured with ginger and soy and served with fragrant herbs. Valentine Warner’s Crispy plaice, pickled cucumber and brown shrimp crispbread makes for an interesting canape or starter, and uses the best of British ingredients.